“Dr. 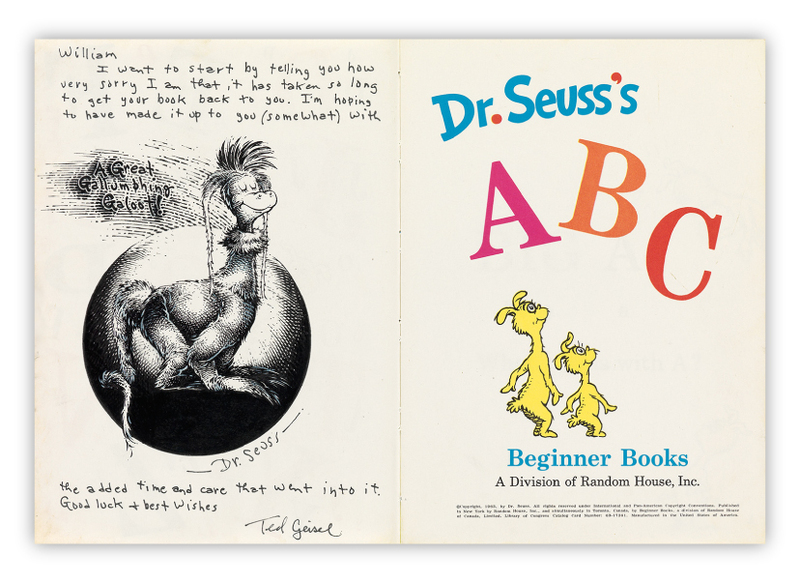 Seuss’s ABC” endpapers drawing not only set the tone, it also became the iconic opening salvo for one of the most important books in his Beginner Books series. 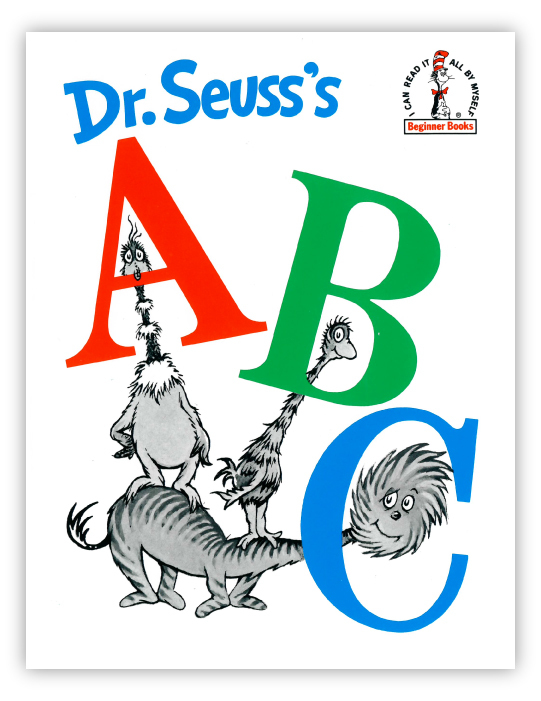 In this remarkable concept drawing, done for the ABC endpapers, Dr. Seuss captures the very essence of his iconic type design in simple lettering and bold colors. His familiar characters, reminiscent of their Hop on Pop counterparts, navigate a world of ABCs. Yet, here they send us on an adventure of twists and turns through the alphabet as seen only through “the wrong end of the telescope,” as Seuss would often say. The Cat in The Hat and The Grinch both appeared in 1957, catapulting him to immediate fame. Green Eggs and Ham, published just three years later, was on its way to becoming universally acclaimed as one of the most popular books in the English language. Then, in 1963, Dr. Seuss’s ABC book and the perenial favorite, Hop on Pop, were published alongside each other, raising the bar once again. Digital Pigment Print on Archival Paper, Image and Paper Dimensions: 23" x 32"
Ted Geisel (aka Dr. Seuss) and the history of his "ABC"
Ted’s mother, Nettie Geisel, was the first to identify the unique artistic side of her son. She believed in the power of reading, music and the arts, and worked hard to make those elements a centerpiece in his young life. This early Seussian sketch of his mother’s chant appeared as the endpapers to the 2010 coffee table volume about Ted’s art and life — Secrets of the Deep. The drawing was done in the mid-1920s and appears to be Ted working out what would eventually become his iconic type design. Here we see a candid similarity to the type design found in his ABC endpapers drawing, which was executed almost 40 years later. Because Ted embraced early the joy of reading, he wanted to make certain that there were captivating books available to aid children in their own quest. To this end, his ABC endpapers drawing not only set the tone, it also became the iconic opening salvo for one of the most important books in his Beginner Books series. Many times Dr. Seuss distilled this concept of reader engagement down to an individual level. When a boy named “William” sent his ABC book to him to autograph, Ted not only accommodated, but took the time to make it a one-of-a-kind treasure with an elaborate new drawing. Such personal gestures furthered his connection with his fan base, linking them deeply to the drawings and writings that were so instrumental in their own lives. The ABC endpapers joins an expanding collection of important Dr. Seuss Concept Drawings. These works reveal a behind-the-scenes look at Ted Geisel’s creative process. They convey the immediacy of his artistic impulse and deliver us right to the moment of a drawing’s conception. He would often create up to four concept drawings for each page he illustrated and throughout their development we see how he altered, improved and drove the image forward to its final iteration. These works are a shining example that perfection is illusive, that it is hard to accomplish one’s goal on the first try, and that dedication to one’s craft is more important than achieving the perfect outcome.